The RKSS, short for Road Kill Super Stars, is a collective of three filmmakers: Anouk Whissell, François Simard and Yoann-Karl Whissell. They co-write and co-direct all their films - over twenty shorts in the last ten years, many winning awards at various international festivals, including LE BAGMAN, TOTAL FURY et DEMONITRON: THE SIXTH DIMENSION. LE BAGMAN is said to be the first horror/slasher/gore film from Québec. It was sold across Europe and was even dubbed in German. The RKSS also wrote and directed the short film T IS FOR TURBO, which was originally made as a submission to THE ABC’S OF DEATH contest. Although the film was not chosen for the first anthology, it won the People’s Choice Award for the contest. 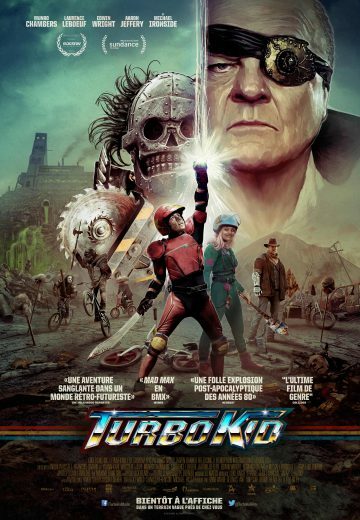 Inspired by the characters of the short film, TURBO KID is their first feature film. Decades after the apocalypse, the world has been left in a permanent nuclear winter. A lonely young orphan called The Kid roams the wasteland scavenging for comic books and paraphernalia from the 80s. After bumping into arm-wrestling champion Frederick, the Kid sees a glimpse of the exciting world he’s been hiding from all these years. His routine existence is disrupted when he runs into the mysterious Apple. Just as Apple starts to bring The Kid out of isolation with unflappable humour and goofy behaviour, she is kidnapped by Zeus, the sadistic and overly-garrulous leader of the Wasteland. Armed with little more than blind faith and an ancient turbocharged weapon, The Kid must confront his fears and embark on an incredible journey to rid the Wasteland of evil and to save the girl of his dreams.